Level 64 and I didn’t even have a cat… can you believe that?! I’ve started doing some random dungeons again to speed up my leveling process, so I figured I should look at getting a cat so that I have some buff variety. I used to have Humar, but I set him loose at some point way back before we received our massive stable expansion. I thought about grabbing him again, but nah… too easy, plus I’ve tamed him several times over the years, anyway. It was time for something new. Humar has a great look for a cat, but he’s so popular that you tend to see him around quite a bit. I wanted something a bit more unusual. Just yesterday, I experienced Beetlemania for the first time! It was groovy baby, yeah! The handsome fella pictured above is my Orc hunter, whom I’ve not mentioned on here for quite some time. In fact, I’d had him set aside for almost the entire expansion up until now. I was having some fun with him back in WotLK, but then he became a victim of the Cataclysm dungeon recalibration – thus making all of his previously awesome gear, that I’d worked so hard to get… useless. Between the need to replace all of his gear, and my desire to devour the higher level expansion content, I ended up shelving him for awhile. At any rate, a few weeks back I decided to indulge my inner dirty Hordie, so I started leveling him again. 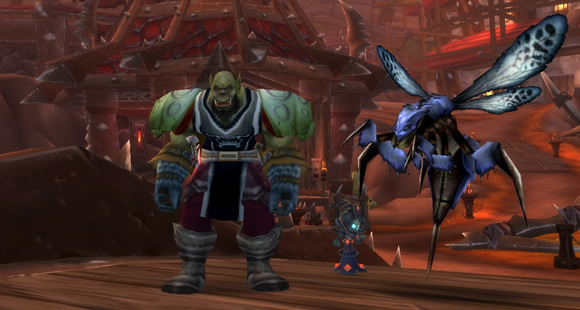 He’s now wreaking his brand of green terror upon the demons of Outland, with his most recent victim being Arazzius the Cruel.